Like many people, I’ve long used Skitch to snap, annotate and share screenshots. Sharing involves Skitch uploading the image somewhere, and putting the destination URL on the clipboard for your immediate use. In addition to Skitch.com, the original product allowed you to specify other upload destinations, including your own FTP or SFTP server. And over time, they added other upload options like WebDAV and Flickr. When Skitch was later acquired, everyone’s suspicions that Evernote would become the primary upload destination seemed to be confirmed when the first Evernote-owned release of Skitch completely removed the ability to add your own custom upload destinations. But in the face of customer revolt, they quickly added those options back. Given that experience, however, I’m not holding out much hope that they’ll add what I’ve been waiting for—Amazon S3—as an upload destination. But I’m happy to report that I’ve discovered a hack that works just as well. The Skitch UI contains a draggable tab at the bottom called “Drag Me” that allows you to drag the visible image to your Finder or other draggable targets (like image processing applications). So I got to wondering whether there was a Mac app that provided drag-n-drop upload to Amazon S3. Turns out, the perfect app exists — Dropzone. Dropzone lets you configure all sorts of drag-n-drop actions, from zipping and emailing your files, to moving them from one folder to another. One such action is “Upload to S3”, and this works beautifully. 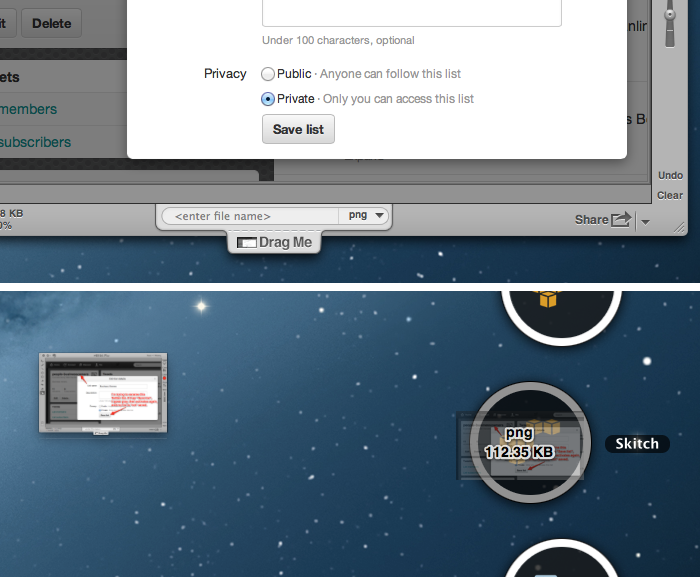 In Skitch, grab the image “Drag Me” handle. Drag it to your Amazon S3 upload action in Dropzone. (I’ve called mine “Skitch”.) You can drag files to Dropzone in your menubar, or it’s spring-loaded access on the right of your Mac’s screen. After a couple of moments, Dropzone will report successful upload of the image and will copy the S3 URL to the clipboard, ready for use.